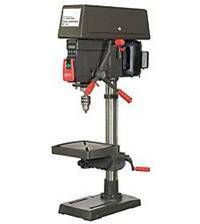 Our Professional Table Top Drill Press is ideal for canceling all types of dice, quickly and easily. The Table Top Dice Drill is equipped with heavy duty, advanced features that make the Drill simple, reliable, and durable. The Table Top Dice drill features the following specifications: 120 volt, 6 amp power; a 37 inch height; and a net weight of113 pounds. For additional information on our Dice Drill Machines, please contact us at 1-800-233-0828.